It's 11pm already when I received an sms stating that my uncle and his family is about to leave their house in Novaliches, Quezon city. I'm waiting for them from my house in Laguna, my backpack is already set for our 3 day stay. I'm excited for my first ever road trip to the Bicol region! It was in 2008 when I had the chance to visit Naga for our last taping for our farewell episode in Star Magic Presents Astigs. It was memorable for it was my last field production work with ABS-CBN after deciding to leave the company and pursue into business and blogging. This 2012, the Bicol trip came as a surprise after my uncle invited me to go with them to Legazpi, Albay, aunt Lily's hometown for a relative's wedding plus hoping to have a side trip in a private island in Sorsogon. I was smiling from ear to ear when i heard the words "private island". Here's my chance to finally bury my feet in the shores known for sheltering the gentle giants this summer. They reached the house at around 12mn. After a short stop and some catching up over our favorite coffee, we finally hit the road before 1am. We're driving a Toyota Fuego 2000 - good enough for 5 people to fit in and still having enough space to move. I made sure to have all my essentials right beside my seat - travel pillow, Canon ixus, sarong and a Headware accessory which i found so useful I wore it as a headband when going out of the car and when under the sun, an eye shade when i feel sleepy, a mask to cover my face when the aircon gets a little too cold and as a ponytail. It's my newest travel must have because it serves a variety of functions. I easily dozed off but just after a few hours of sleeping inside the car, we woke up to a horrible traffic in a zigzag diversion road along Atimonan, Quezon. After an hour of waiting, our small car finally managed to drive in between the site of the accident, leaving the bigger trucks and buses which we heard might just have to wait for another 2 hours before the road can be cleared (read GMA report of the accident here). Right beside the crash, a sign reads - "Bumagal. Madalas Aksidente dito." Spine tingling! An hour has been wasted, but heck we're really not much in a hurry. But now hungry for breakfast, we stopped by this humble seaside restaurant in Gumaca, Quezon. Lolo Ompo, as I found out, serves the best bulalo in Quezon, adding to that the pretty sunrise we've seen right in front of the restaurant. Bulalo for breakfast! The restaurant gave us that much needed break and some positive vibe I personally needed after seeing the highway accident. 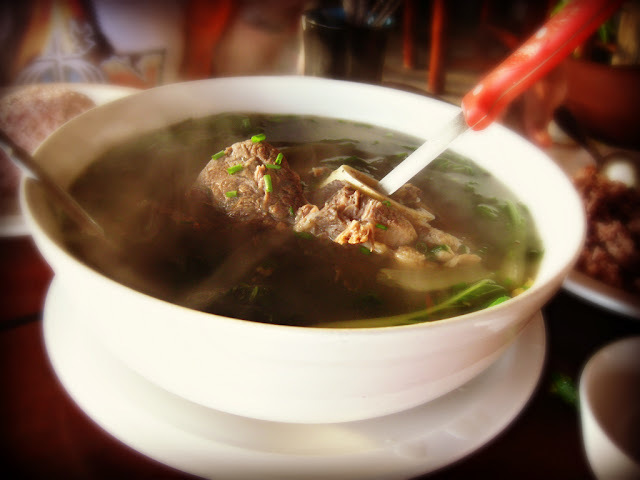 The hot soup is comforting and their local version of brown rice is a healthy treat against the calorie boosting bulalo. Their version of the bulalo is fine but not as remarkable as other homemades I tasted. We drove non-stop for another hours until we reached the Petron Station in Sipocot, CamSur. Beside it is a convenience store. There, we ate some snacks and coffee to kuya Ferdie to keep him up for another stretch of long drive. Beware though, the station's restroom especially for girls stinks badly, I couldn't even force myself to get inside. When we passed by the area of Guinobatan, aunt Lily started sharing stories about her hometown where she grew up. The sleepy road reminds me of my hometown too in Sultan Kudarat. She also started pointing the spot where Mt. 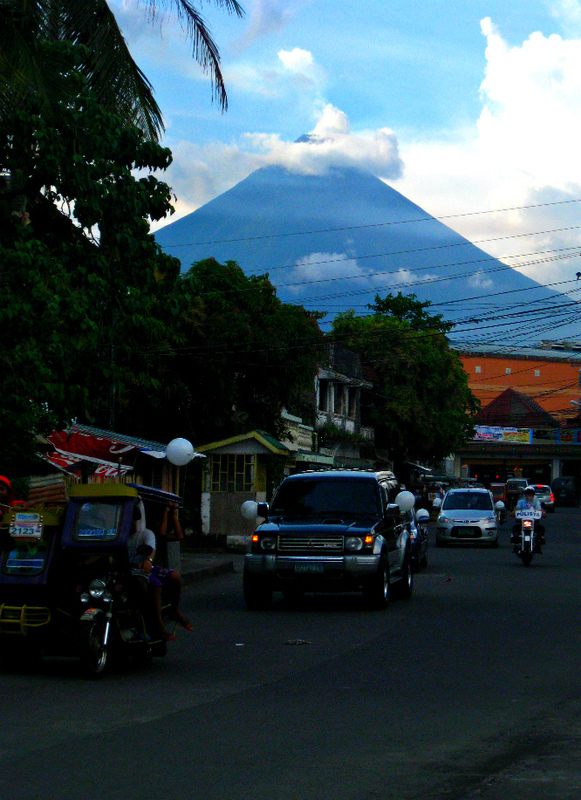 Mayon is, but alas I couldn't get a good glimpse from the car. When we reached Legazpi, we saw banderitas all over. Surprisingly, we're right in time for the Magayon Festival. We reached the house of my aunt's sister at about 1:30pm, more than half a day on the road, getting some much needed stretches and good welcome food was definitely a treat. We were served with one of the freshest fish I've ever tasted, much like that of GenSan's tuna. But the real treat was seeing the Mayon Volcano right outside their home. I will be blogging more about my weekend stay in Bicol, we even drove down to Sorsogon. It's definitely my longest road trip experience so far. It might have been scary at times (seeing trucks turned upside down is definitely not a sight I wish to see, yet I've seen around 5 different road accidents in just 3 days!) But this won't stop me from going back to Bicol. My new mantra - "FEAR ends when FAITH begins." wow such a long ride =D nice one! I have been seeing a lot of mayon in several blog posts! I have experienced travelling by bus fropm Legaspi to Cubao years back. it was back breaking...literally.